3. Moulding M/c. (ARPA - 450) 2 5 Ton / Each DISA Indian (P) Ltd.
7. Intensive Centifugal Sand Mixer 1 500 Kg. / Batch DISA India (P) Ltd.
8. Rotary Shake Out M/c. 1 40 Ton / Hr. DISA India (P) Ltd.
9. Bucket Elevators 2 40 Ton / Hr. DISA India (P) Ltd.
10. Belt Conveyers 6 40 Ton / Hr. DISA India (P) Ltd.
11. Oscillating Conveyor M/c. 1 40 Ton / Hr. DISA India (P) Ltd.
12. Polygonal Screen 1 40 Ton / Hr. DISA India (P) Ltd.
13. Fluidised Bed Sand Cooler 1 40 Ton / Hr. DISA India (P) Ltd.
14. Over Band Magnetic Seperator 1 40 Ton / Hr. DISA India (P) Ltd.
16. Dust Collector 1 40 Ton / Hr. DISA India (P) Ltd.
18. 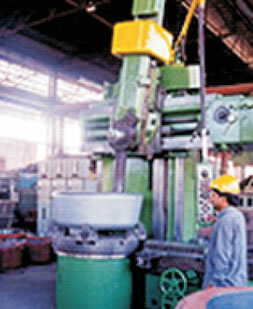 Hydraulic Mould Handling System 5 80 Boxes / Hr. 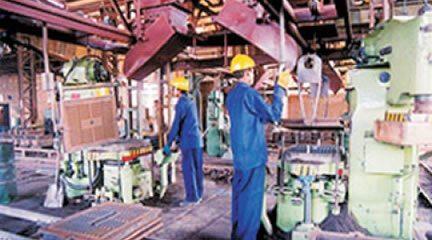 Jib Engineering (P) Ltd.